There are few things in life that can get you up voluntarily on a Sunday morning before sunrise, the prospect of seeing the sunrise come up in the east in shades of grey red while you drive at a speed which few vehicles can match, can certainly get you out of bed. 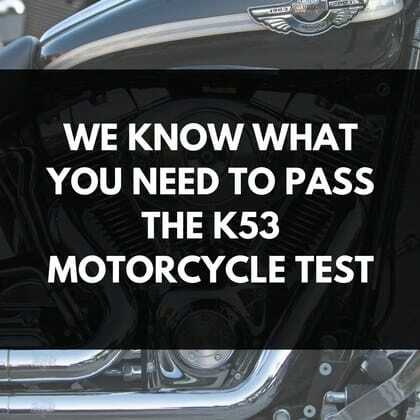 Whether you drive alone or whether you drive in groups, it is an unmatched experience which will open up to you when you pass your K53 motorcycle test. Driving this magnificent machine can barely be compared to driving a vehicle, you have the ability to manoeuver through traffic, you have the ability to drive through cities towns and across the country within hours. With the wind pushing against you, the horsepower beneath you and the cars zooming past you this is something you need to do at least once in your life. There are different sections in the driving test. These sections have been specifically designed to ensure the application of safe driving techniques on the road, whilst protecting yourself and the other drivers on the road. 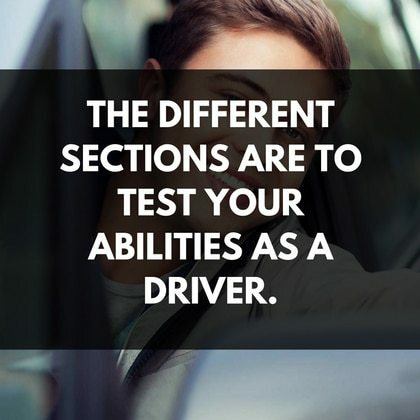 The different sections are to test your abilities as a driver. Your knowledge regarding the roadworthiness requirements along with your ability to start and drive is tested. The skills which are tested ensure you are able to drive without creating a dangerous environment. Your competence in handling a motorcycle. Obedience of traffic rules, road signs and markings. Implementation of K53 vehicle controls. During all the sections of the driving test you need to remember that it is a test, you will be monitored throughout the completion of your driving test to ensure you have the abilities to control the motorcycle. The instructor will be monitoring your competence and obedience of the rules and marking along with your ability to use the vehicle controls. Before you commence with any sections you will receive instructions from the examiner which will inform you of the requirements along with the procedures which you can expect during the test. It is expected that you treat the test as though it is taking place on public roads, expectations are thus created that you will commence with all observations and give all the appropriate signals. You are required to wear an appropriately fastened helmet. Under no circumstances are you permitted to lift any wheels off the road surface. You will instantly fail if you touch any boundary lines during the performance of a manoeuver. The road signs, signals, rules and markings have to be obeyed at all times. When you are leaving the motorcycle unattended the engine needs to be switched off. You are not permitted to engage in uncontrolled or dangerous actions. You are allowed to ask the examiner any questions on the requirements. The examiner’s instructions are to guide you on the requirements of the test along with focusing you on the task ahead. They want to ensure that you protect yourself and other drivers on the road and in the yard when you attempt your licence. As with any test, there are different sections, this test consists of two sections which will be regulated in different locations. The sections have been designed to test the different abilities of the driver, ensuring that you are capable of controlling the motorcycle. Starting and stopping the ignition. Controlling and managing the speed barriers. Accelerating into movement and making the left turn. Without rolling backwards, stopping on an incline and pulling off. The first section is completed in the yard. This section has been designed to ensure that you can identify the roadworthiness requirements and that you have the basic knowledge required to engage in handling and controlling the motorcycle. Judging the speed of both left and right turns. Handling of emergency turns to the left and right. Ability to stop in a controlled manner. The second section is completed in the testing area where your ability to drive will be tested, your skills on turning and initiating emergency manoeuvers will be tested. Please read our other articles if you're looking for more information on the learners test and how to pass your learners..